"MONO X: Look For Me – Lucy Kerr"
LOOK FOR ME (2016) is a multimedia project intersecting a two channel film and performance. The film component of this work was shot on 16mm using an Arri S camera. Portions of the film were hand processed by the director and the footage was edited digitally. The music accompanying this piece is an original score composed on both analog synthesizers and digital software and recorded on a reel to reel tape machine. LOOK FOR ME is a visual portrait of a female figure in conversation with her memory. The performer on stage is multiplied through the projected images of herself in distant landscapes. This work is inspired by Simone de Beauvoir’s notion of ambiguity, in which a person is painted as being both subject and object. In LOOK FOR ME, the figure is extracted from herself as other than herself. The audience is invited to witness the performer as if she is looking at herself through the lens of her imagination. 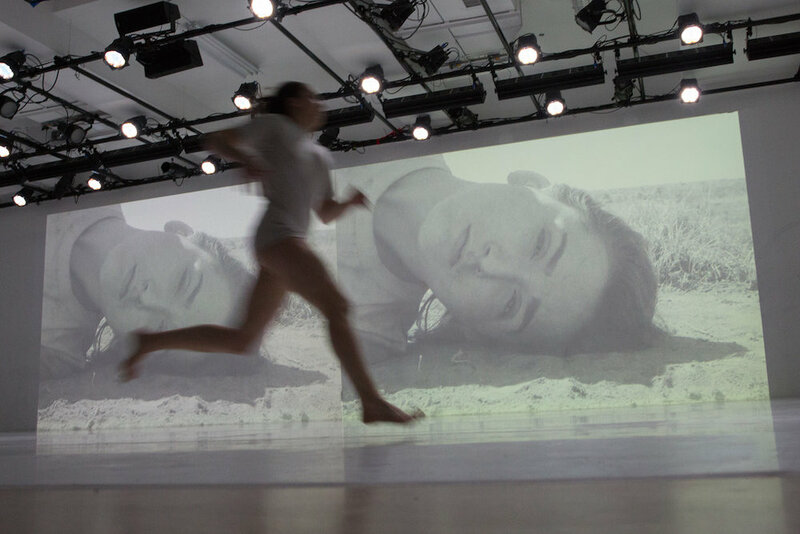 Lucy Kerr is a Brooklyn-based choreographer, filmmaker, performance and installation artist, and writer. Kerr was born in Houston, TX in 1990. She holds a B.A. in Philosophy and a B.A. in Theater and Dance from The University of Texas at Austin, where she was the grand-prize winner of the 2014 Co-op/George H. Mitchell Awards for Academic Excellence for her undergraduate thesis. Kerr was selected as a 2014-2016 Fellow at LEIMAY in Brooklyn, NY. She creates films and performances inspired by tension between reality, memory, and imagination. She often combines film and performance mediums in the same moment as a way to embody the simultaneous and contrasting dynamics of personal experience. Kerr has created immersive installations for The Chimney NYC and Co-Lab Projects (Austin, TX). Her performances have been presented at The Brooklyn Museum, Triskelion Arts, IDIO Gallery, and LEIMAY. Kerr’s film, Burning As It Runs, will make its world premiere at the 2016 San Francisco Dance Film Festival. Kerr was the writer of LEIMAY’s theoretical and archival publication accompanying the production of ‘borders’ at BAM. Her own writing involves research in existentialism, performance and film theory, social theory, and Eastern thought, and serves as an undercurrent for her film and performance projects. CPR is an artist-driven initiative, co-founded by Jonah Bokaer | Chez Bushwick and John Jasperse | Thin Man Dance, Inc. CPR’s mission is to support the development of new works in contemporary dance, performance and related forms, and to promote awareness of and appreciation for contemporary performing arts. CPR is particularly interested in supporting artistic processes that integrate visual design, installation, and technology. More info at http://www.cprnyc.org/events/mono-x-look-for-me/.